Thanks for celebrating Valentine's Day 2019 with us! See you again next year! 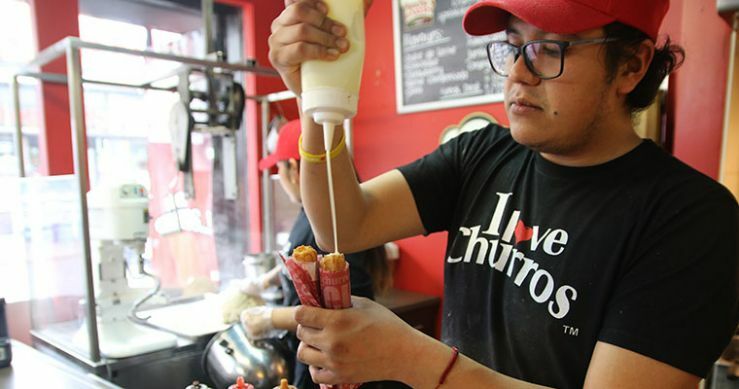 Make this Valentine’s Day unforgettable with a one-of-a-kind food tour in Kensington Market. You’ll enjoy the sights, sounds and tastes of this National Historic Site as you try a variety of sweet and savoury delights from around the world, ranging from Chinese snacks to Canadian delights. An edible walk to remember. Easy. Some narrow and crowded sidewalks, crossing some major roads. Max 5-min walk from store to store. The tour can be made entirely vegetarian and can be partially vegan and gluten-free. Nut-free samples are available at all locations but may contain trace amounts of nuts. Other restrictions may be accommodated. Please list any food restrictions in the 'Dietary restrictions' field when booking a tour. If you enjoy the tour, please consider leaving a tip for your tour guide to thank them for their good work! If your sweetie is a chocoholic, this sumptuous 3-course chocolate dinner is the perfect Valentine’s Day experience. We've joined forces with unique non-profit Livelihood Cafe to treat your love to an exciting culinary journey exploring chocolate in a variety of forms and flavours. 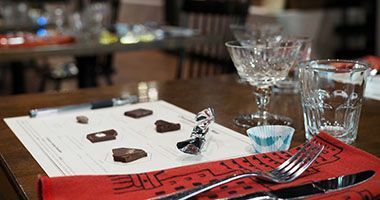 We’ll start with a guided tasting of artisan chocolates for your ‘appetizer’, follow up with a savoury chocolate-infused main dish (paired with a glass of bubbly), then cap off dessert with Tasty Tours’ exclusive butter tart-chocolate truffle invention, the Toffle™. You've never had a dinner like this! Additional non-alcoholic drinks may be purchased (e.g. tea, coffee) separately at the event venue. Due to the complexity of this event, unfortunately the menu cannot be modified from the above prix fixe dinner. Feb 14 (Thurs), 8pm - 10pm SOLD OUT! Champagne and chocolate, is there a better combination? 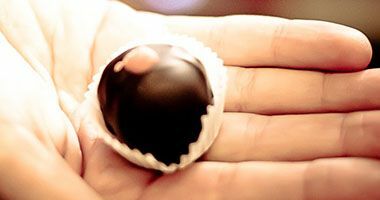 Let romance bubble in the kitchen as award-winning chocolatier Odile from Odile Chocolat tantalizes your tastebuds with couverture chocolates and teaches you to roll your own champagne-infused chocolate truffles. Bring home your chocolate creations! The workshop is vegetarian and gluten-free. The chocolates are nut-free but may contain trace amounts of nuts as the workspace is not nut-free. Please list any food restrictions in the 'Dietary restrictions' field when booking a tour. This is primarily a standing-only class. Be prepared to be on your feet making magic in the kitchen! Feb 10 (Sun), 5pm - 6.30pm SOLD OUT!